VIBROWEB XP is a compact VIBRATION MONITORING and self-diagnostic system specially designed for critical process and production machinery. The Black Box Technology automatically runs through each programmed measurement task, saves and analyzes data, and provides alarm notification during operation without connection to a PC. This system allows you to use current line drive or ICP sensor technologies. The VIBROWEB XP has the capacity to handle up to 8 vibration channels, three process parameters, two displacement probes, one rpm, and one trigger input. All sensors are powered simultaneously to reduce data collection time! 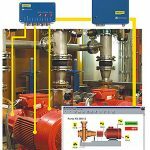 This facilitates REMOTE MONITORING of extruders, remote pumping stations, emergency power supply systems (UPS), special drives, low running-speed machines, and process ventilators. Alarm notifications and tele-diagnosis is accomplished through any Internet browser. VIBROWEB XP can be accessed remotely via Ethernet, modem, or radio. 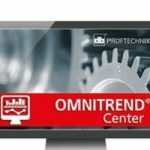 OMNITREND PC SOFTWARE provides additional capabilities for programming, trending, evaluation and archiving of the machinery condition. VIBROWEB XP wind, online-condition monitoring of the complete drive-train of wind turbines including vibration accelerometers specially developed for low speed machines.